Fitbit is a California-based company that develops and manufactures compact, wireless wearable technology for the health and fitness industry. Founded in 2007, the company has gained attention due to its rapid growth and success. In a time span of five years – from 2010 to 2015 – Fitbit’s revenue increased from just over 5 million U.S. dollars to more than 1.8 billion U.S. dollars. The health and fitness wearable devices market is one of the most promising segments of the wearable industry. In 2016, 55.2 million fitness trackers were sold worldwide. This figure is expected to increase to 105 million in 2022. Fitbit’s first device, the Fitbit Classic, was released to the consumer market in 2009, and had limited features compared to the most recent models. The Fitbit Classic only kept track of steps, distance, calories burned and activity intensity. In order to stay competitive in the fast-growing wearable technology industry, the company released multiple models and features throughout the years. As of 2016, Fitbit had seven models in the market that vary in price range. The Fitbit Flex 2 is the least expensive with a suggested retail price of 59.95 U.S. dollars. The smartwatch Fitbit Ionic is the most expensive with a suggested retail price of 299.95 U.S. dollars. Since 2010, Fitbit has sold about 76 million devices worldwide, and has over 25 million active users. The company is amongst the leading companies in the wearable market. Some of Fitbit’s competitors are well-known companies such as Jawbone and Xiaomi, and technology giants such as Apple and Samsung. 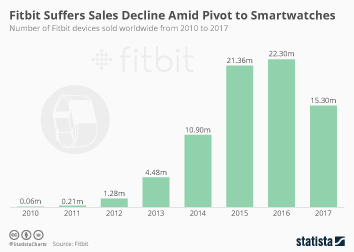 Fitbit shipped 5.4 million units worldwide in the last quarter of 2017, while Apple shipped eight million wearable devices worldwide in the same period.